Auntie M is a huge fan of Jane Casey’s Maeve Kerrigan series (The Last Girl, The Stranger You Know, et al). So it should come as no surprise that when she turned her hand to YA novels and introduced Jess Tenant in How to Fall, that she had another hit series on her hands. 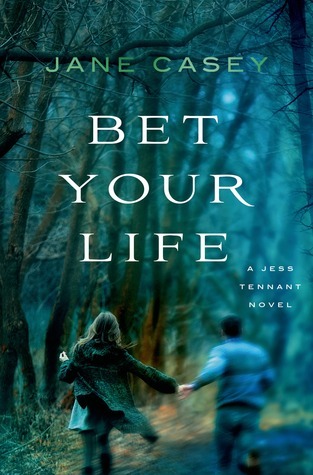 The second Jess Tenant Bet Your Life, has the same realistic teen dialogue and situations as the first. There’s Jess’ complicated family life and her even more complicated attraction to Will, the person who makes her brain fuzzy and who she decides is better off without her. At sixteen, Jess is pretty mature, living in a tiny seaside English town for the past few months, keeping an eye on her mom while pretending she’s not missing Will, away at school. Hallowe’en night changes everything. Seb Dawson has been left for dead at the roadside with a serious head injury. Jess isn’t a fan of Seb’s, but he didn’t deserve what happened to him. With her feeling the police are not taking his attack seriously enough, it falls to Jess to find out who was behind Seb’s attack, and her investigation takes her places she doesn’t want to go. It turns out Seb wasn’t the nicest of young men, a secret predator who plays dangerous cakes to abuse girls, from blackmail to spiking their drinks with drugs. The list of victims who could have a motive for revenge on Seb becomes long. Or could it have been a bunch of them banding together? Even more so, could there be someone else with a need to silence Seb? The tension rises the deeper Jess finds herself involved until her own life is in jeopardy. Casey has created believable characters and situations that make Bet Your Life a gripping read for adults and teens alike.